Jypyä Pop (Turku, Finland) on 6 September 2018 in Lifestyle & Culture and Portfolio. Looks like a hospital or maybe the line of chairs outside the principal's office at school. If that is the case, all the students must have been good today! @beach: You are right. It's a waiting room for a health center. I was waiting for the nurse to call, because my ears were blocked by the ears. Interesting to see how the mirror adds the depth to this composition. Ah, health center ! Very nice atmosphere. I like your point of view to include the mirror reflection. I hope all is well with you!!! @Ruthiebear: Thank you. Everything is allright again. Cleaver use of the mirror. An interesting waiting area. A doctor's office? @Steve Rice: It's the nursing room I was waiting for. My ears were so locked because of the wax that I was deaf. 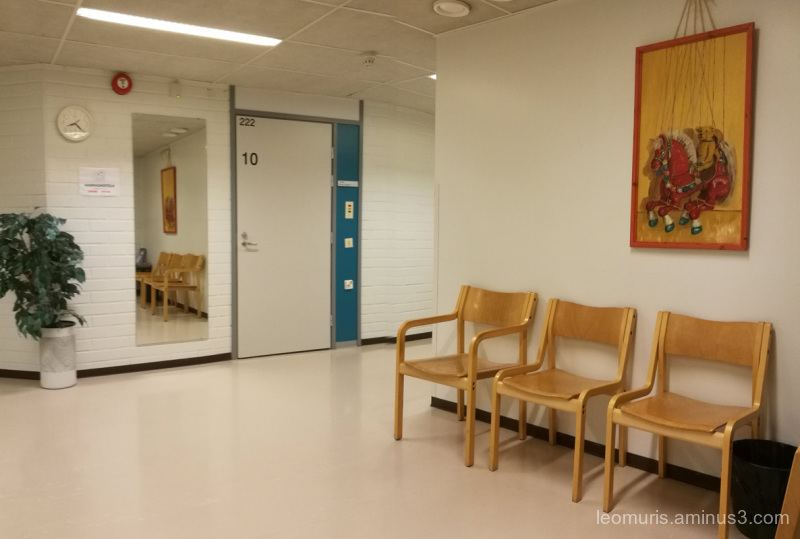 @pascale: It is nurses waiting room. this could be anything from a dentist's office to the school principal's. Modern institutional blandness well depicted.